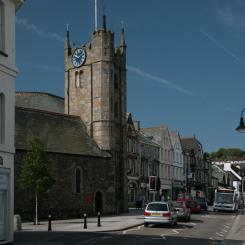 Okehampton has been welcoming visitors for over 2,000 years. Some were invaders rather than visitors. The area was initially settled in the Bronze Age, extensive evidence of which can still be found on the slopes of surrounding moorland. Saxon rule came in the 7th century. The name ‘Ocmundtune’, meaning settlement by the Ockement, is first recorded in AD 980 as a place where slaves were freed at a cross roads so they could chose their own destiny. The Saxon settlement was probably built around the parish church which still stands over half a mile from the modern town. The Saxon lords were overthrown by the Norman conquerors. Baldwin de Brion, the first Norman Sheriff established Okehampton Castle as the administration centre of his vast estates in Devon. These passed by marriage to the Courtenay family, who rebuilt the castle as a lavish but defended country retreat. In 1538, Henry VIII seized the estate and had Henry the 9th Earl beheaded for conspiracy. The town grew in importance during the Middle Ages but the great castle never saw a shot fired in anger. This remained the case during the Civil War where Okehampton was careful not to take sides. The forces of both the Royalists and Roundheads used the town as a garrison at some stage. Visitors today can step back into the past with a visit to the ruins of Okehampton Castle, which dramatically stands just a short distance from the town centre. If ever there was an industrial revolution around Okehampton it was on Dartmoor during the Middle Ages. The technology, scale and political organisation of the tin industry was truly amazing. Trade in tin and wool created wealth, which led to the rebuilding of many local churches. Much of this history can be explored in the museum, where you will find a variety of artefacts tracing the history of the moor and the people who lived in the area. In the 19th century there were great improvements in communication, with better roads and, in 1871, the railway, which resulted in many more people visiting Dartmoor and the town. Dartmoor offers an unique experience to the visitor. The hills and tors are topped by weathered granite, surrounded by clitter which seems to have been shaped by human hand. The landscape’s ancient trackways provides a passage to prehistoric settlements, stone circles and industrial litter of medieval tin workers. The distinct upland habitat of peat bogs, running streams and wildlife offers an unequalled experience. Dartmoor is not quite the wilderness it first appears.